Kufic script is derived from "Hijazi Script", whose origin may in order be traced to "Hirian", "Nebtian" or "Anbarian". Available petrography and existing documents, which belong to 7th century AD, indicate that in different kinds of irregular arabesque writing, Naskh and Kufic scripts, have been carelessly used and no rule or method was officially proposed to follow. The object has been only restricted to recording of written materials and their concepts, without paying attention to the elegance and artistic issues, which would have enriched those handwritings. Such samples could be found in some available inscriptions on stone and in a few documents as well. But, when calligraphy was employed in the service of Islam for writing Koran, it entirely got changed and gradually paced in the path of perfection from viewpoint and aspect of art and elegance. Its first style of Islamic period writing, in which the manifestation of art, delicacy and beauty are explicitly evident, is that of Kufic Script. As, it was developed in the city of Kufa, it is called "Kufic". During the first three centuries of Islamic period (7th-9th century AD), Koran was practically written and recorded with Kufic script, while calligraphers of every zone used to use their personal style and taste in this sort of handwriting. The nibs of their pens might have been different from one another, or the tendency of vertical ribs of the letters towards left and right sides, together with some other invented differences exerted in the chosen letters, might have been characterized the style and place of writing. Thus, various ways of inscribing letters, like those of Kufic, Madani, Basri, Shami (Syrian) and Maqrebi scripts came into existence. In spite of all these differences, so long as using of Kufic script, uses particularly restricted to Arabian peninsula, no significant changes appeared in the original forms of this handwriting. In fact, Kufic script could be known as the first and earliest calligraphy, used in writing many copies of Koran, which are still found here and there. The early Kufic script did not have any signs to display the correct pronunciation of words. Even word's dots were not used on or under the letters. But, in the course of time, signs for pronouncing vowels gradually appeared. Abdul-Asvad Doeli (1310 AD) has been known as the first scribe, who used such signs. In the available copies, written in Kufic script, cinnabar-red circles are more or less contiguous to Arabic letters, to show proper sounds of the desired pronunciation. Dots and points (Ejam) could also be seen. Signs, for eloquent resting of Koran, later appeared on the basis of Choice and Convention of readers or scribes. With the advents of "ibn Mogla" (950 AD) and "ibn Bavvab" (1034 AD), Kufic script was no more used by Arab calligraphers and was relaced by "Thulth", "Reihan", "Mahaggag" and "Naskh". Thence, Arab scribes only used Kufic script in writing the rubrics of Koran's texts and margins, which were mostly as decorative designs consisting of ceruse or gold work traces done on azure background. In non-Arabian Muslim areas, the use of Kufic script was not practically restricted to this aspect or dimension. In the course of time, it got evolution and was used in inscribing many epigraphs and writing books in the vast area, stretching between the borders of China and Spain. One of the most important Eastern Kufic (Iranin) Scripts was a kind, which is now called "Piramouz Kufic Script" that has greatly acquired. This form or style of writing is indeed the most beautiful from the viewpoint of its elegant characteristics, such as having regular separations between the related letters, which make words. In order to avoid spending much time for and on writing, calligraphers, gradually, gave up the method or style of using separate letters in putting down a single word; thus, new letters were regularly joined together like those of Kufic or other words inscribed. Although, such style of writing has been relatively transformed in the course of time, taking new kinds and shapes, and being used in different areas, ruled by different governments, yet it is still known as Eastern or Iranian Kufic Script. Large number of copies of Koran and too many other books, written or printed in Persian, as well as various manuscripts are, at present, available here and there. The reason of long prevalence and vast circulation of this style of writing, lies in its easy quality of being either written or read. As, Kufic script was used mostly in writing Koran, different kinds of Kufic script became as sacred phenomenon and got holy aspect. Calligraphers tried to create as more beautiful and charming letters and words, as possible in innovative handwritings. Various sorts of artistic symbols and tokens, introduced natural things or man-made objects, were explicitly used and observable in those sacred letters and words. The present description of above-mentioned work of art cannot quench the thirst of those who may seize the opportunity of witnessing such beautiful copies and manuscripts with their own eyes. One can enjoy his time by watching them for hours or even for days in appropriate occasions. As, Kufic script was used in architectural designs on the basis and tastes in fashion of every area or vogue of time, Kufic script has been chronologically changed from viewpoint of its shape and style of inscription. Decorative designs of this script could be seen on some pillars, minarets, porches and on walls of palaces. These decorations have been either done through plaster molding or by stone carving. 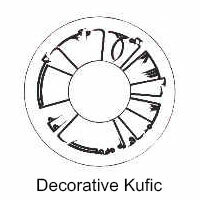 Some ingenious craftsmen or artisans have successfully shown their artistic creations concerning Kufic script, in fine and multi-colored glazed tiles and sorted-out bricks. The history of all this covers a long period of 1000 years. In short, one has to try to discover the mysterious beauty and elegance of the different decorative designs, skillfully used in presenting Kufic script here and there in different objects and instances. The manifestation of such Eastern beauties has been spread from Al-Hamra Palace in Spain to the ruins of Victory Garden in Ghazneh. Reports and records have been hitherto prepared on these relics by the experts of calligraphy and graphology. Many of the examples, found in the present collections, have been given on the basis of such inscriptions.